I’ve been following the Beekman 1802 website the past year, and in that time, I’ve read a bit to expand my knowledge of all things heirloom — seeds, farming, gardening, animals and more. This Christmas, I purchased heirloom seeds for everyone in my immediate family to accompany their presents. My brothers got the 1802-1850 vegetable collection, my dad got the tomato seed collection, my mom got the the flower collection, and my mother-in-law got the historic zinnia collection. 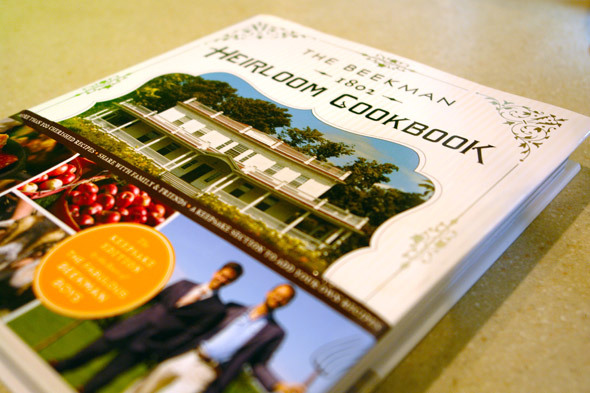 I purchased all of the above for my husband and me to plant this spring, and I added “The Beekman 1802 Heirloom Cookbook” to my wish list. The cookbook, written by Brent Ridge and Josh Kilmer-Purcell with Sandy Gluck, is a beautiful collection of recipes for every season, to be passed on from generation to generation. I gratefully received the cookbook as a Christmas gift from my mother-in-law and I got to work with it right away, reading and bookmarking and cooking. One reason I was drawn to this cookbook is its simple and genius organization by season. Like The Fabulous Beekman Boys, my husband and I strive to have an understanding of where our food comes from, and we try to eat seasonally as much as possible. I thought it would be great to have this addition to my cookbook collection because I love flipping to the index in all my books and finding recipes using ingredients from my CSA, market trips, Lexington Co-op finds, etc. With that said, there’s certainly some flexibility here, and to illustrate that, the first recipe I made from the book is actually a “fall starters” recipe, rather than a winter one. When I noticed there are still so many delicious apples at the Co-op, I thought it would be fun to make a soup with apples as one of the main ingredients. Cut off and discard the very tough bottom of the cauliflower. Halve the cauliflower lengthwise; then cut crosswise into 1/2-inch-thick slices, including the central stalk. Transfer to a roasting pan along with the apples, onion, ginger, garlic and a 1/2 teaspoon of salt. Add the oil and toss to coat. 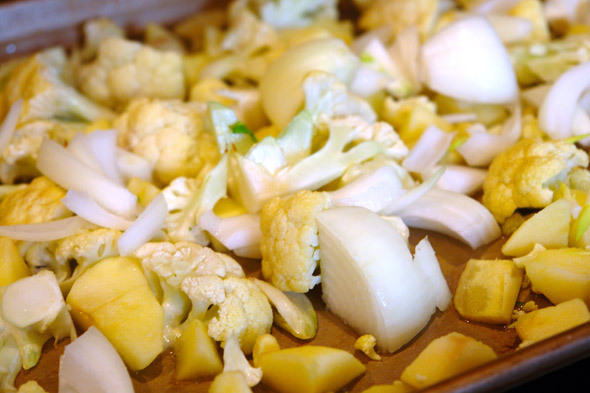 Roast for 40 minutes, tossing the vegetables occasionally, until the cauliflower is lightly browned and the onion is tender. Working in batches, transfer some of the vegetable mixture and some of the broth to a blender (don’t fill more than half full for each batch). Puree until very smooth, about 3-4 minutes. As you work, transfer the puree to a saucepan. Place the saucepan over low heat to reheat the puree. Add salt to taste. Serve garnished with a grating of nutmeg. 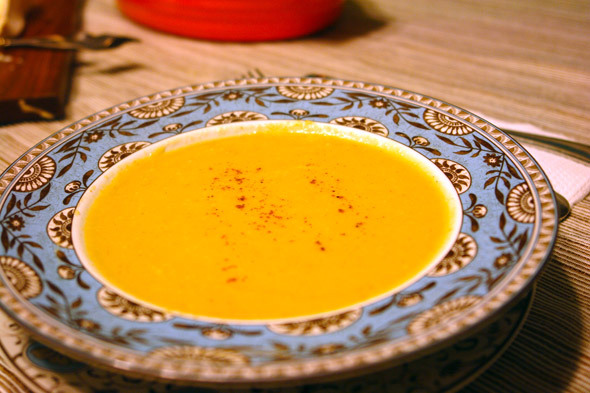 Especially as the temperature is dropping, this soup makes a wonderful start to any dinner, or can be a meal in itself for lunch. When I made this the other night, my friend, Kim, brought a delicious multigrain baguette and an outstanding brie to accompany the soup. I highly recommend having this soup with your favorite crusty bread so you can soak up the remnants in the bowl. I also served roasted winter squash with pine nuts on the side. 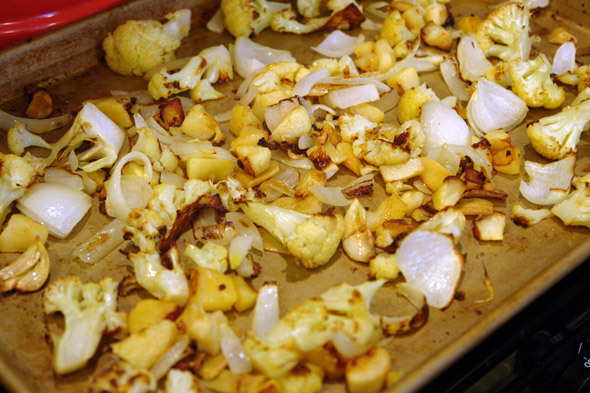 The heat of the ginger aftertaste makes a lovely complement to the sweetness of the roasted apples and cauliflower. 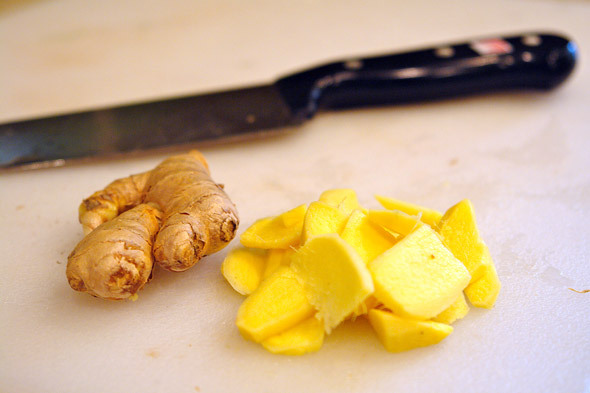 My husband noted it really tastes spicy from the ginger, so if you don’t care for too much of that flavor, you should cut the ginger in half. 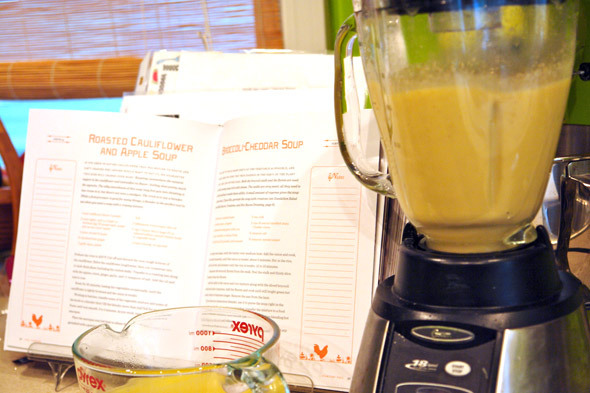 As the recipe in the book notes, the soup is rich and creamy, yet has no cream or butter in it. Swap the chicken stock for vegetable stock and you can easily make this a vegan dish. I hope you enjoy this dish and consider exploring the Beekman 1802 site. It offers a great deal of inspiration to us about seasonal living! That soup looks really good, I am definitely going to try it. I love all of those ingredients and never thought to put them together. 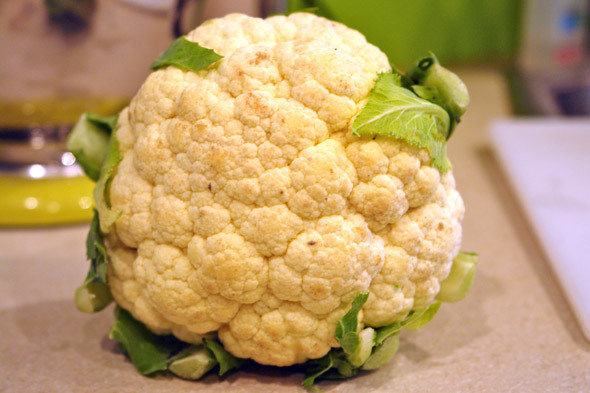 Did you get your cauliflower from a winter CSA? I got the cauliflower from the Lexington Co-op, but if you know of a Buffalo area winter CSA, please share! I would be very grateful. Our CSA ends in late November. (We just ran out of our precious last few onions!) I haven’t heard of any that go through winter. Enjoy the soup. It’s a keeper. Nina, thanks so much for sharing this. I am really interested in getting the book. Also, when I thought I saw you on Elmwood, we stopped into the Lexington Co-op. I wish we lived down there and not in ROC. Cait, I think you’ll love it! It’s filled with awesome recipes, but it’s a great resource too 🙂 I wish you lived near Elmwood and shopped at the Co-op all the time too. Then I could see you more!! Someday you’ll be back! In the meantime, enjoy the soup. It’s delicious.